A friend of mine recently returned from an epic adventure, cycling alone from Amritsar, via the Hill Stations of North India, to Kathmandu, and having returned home to no job, I invited her on a mid-week adventure road-bike ride. I wrongly assumed she would turn up on her speedy road bike, but because I had mentioned ‘adventure’ in the invite, she turned up on …….yes, you guessed it, her adventure road bike, complete with rack AND pannier, containing a D-lock and a book to read whilst waiting for me. Surely taking things a little far for a trip up the North Downs? I’ll admit to enjoying the rare weight advantage, as I am normally the one with the heavy bike. At Carshalton we left the river, continuing on SR 20, and with the first sign of open fields, passed Oaks Park, the famous lavender fields of Banstead, and on through Coulsden via a short but fun section of off-road. Our route up the North Downs was over Farthing Down, another one of my favourite sections, with great views back to London from the top. I let Kate go ahead ……okay, I confess my legs where weaker than hers and despite the weight advantage, I needed a Sainsburys Flapjack Square and an apple at the top to regain my composure. And so to the section of the route that was un-reccied and off-road. It was a section heading west along the top of the North Downs, which is also part of the Pilgrims Way, and I was particularly interested to see if it was suitable for an adventure road-bike, as the small tarmac lanes around this part of Surrey are crammed with cars and bikes (and bad attitudes on both sides). It was a blast, but then I would say that! 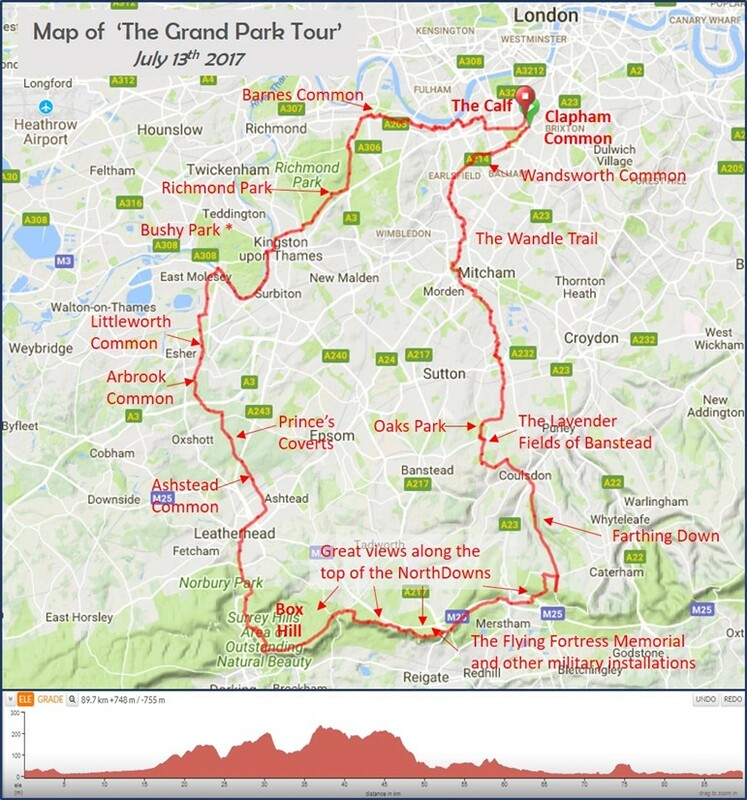 We veered off-route a couple of times, due to too much chatting, but it was possible to ride the entire section to Box Hill with the minimum of ‘dabs’ and no dismounts, and what’s more, the views south over the Weald were great. At Reigate Hill we passed the memorial to a US Flying Fortress Bomber, which crashed in 1945 on it’s way home from a raid along Czech border. If the ‘wing tip’ memorial is located exactly where the plane crashed, it only missed the top of the Downs by tens of feet (obviously that is of little consolation to the crew and pilots). My post ride research unearthed an intriguing article about Reigate Fort, and the military mysteries of the area including secret bunkers and underground tunnels and caves, which we cycled past without knowing ….for obvious reasons. If you are into mysteries or military history click here. The Famous Lavender Fields of Banstead! Whist on a military subject, I always joke about Surrey being full of retired Colonels, and after doing a bit of research on the Inglis Memorial, (described as an ‘elegant rotunda’, and former drinking trough, which we passed further along the track,) I discovered that Lt Col Sir Robert William Inglis, donated the Memorial to the borough, but much more significantly, he halted plans for a housing development on the top of the Downs at Colley Hill, so it turns out retired Colonels can be a force for the good! Box Hill was as empty as I’ve seen it, but Kate not being a South Londoner, couldn’t get over how many cyclists there were (mainly practicing for the Ride 100 which takes place in a couple of weeks). All I’m saying is there was no queue at the coffee shop. Refreshed with a mint and pea soup, a packet of crisps, a large shortbread biscuit and a cappuccino (for my part), we embarked on the next section of the ride, which took us down the Box Hill zigzags and the along the wide cyclelane to Leatherhead, where we followed a series of tracks across Ashstead Common, Princes Coverts (a Private estate near Oxshott), Arbrook Common and Littleworth Common to Esher. It was the best trip back through this area of West London I have ridden to date. It involved kissing gates, speed bumps, a level crossing, a pedestrian flyover and lots of great tracks through the woods….oh, and one puncture. My post ride dig on ‘Princes Coverts’ unearthed a wealth of fantastic trivia! The Prince in question is Prince Leopold of Belgium, who married our very own Princess Charlotte in 1816, and his love of hunting led him to purchase the covert (a covert being an area of thick undergrowth in which animals hide) to develop his shooting estate. The route we took across the coverts passed Jessops Well, a source of mineral water known for it’s purgative qualities. The water was bottled and sold to the unsuspecting residents of Berkeley Square for 6d by Lord Clive, who owned properties in both locals. I won’t be using it to refill my water bottle. The area was bought by the Crown Estates in 1867, and according to their leaflet (undated) you have to purchase a key in order gain access. It is currently accessible without a key and provided us with some great rideable woodland trails. We kept to the bridleways, closed all the gates behind us and hopefully left no tracks. There were no signs telling us not to ride. If you want to find out more about Princes Coverts along with a map of paths and tracks that are open to the public click here. (I did find it difficult deciphering the difference between broadleafed woodland of coppice and Areas NOT open to the public, but my assumption is ‘don’t stray off the paths’. We arrived at Hampton Court a full 6.5 hours into the ride and I was toying with the idea of getting a train back from Hampton Court, as even though the mileage wasn’t high, it had taken us longer than expected (I told Kate 5 hours max). However, she is not one for shirking sections and wimping out, so we cycled back to Clapham Common via Richmond Park & Barnes Common; our arrival in Clapham Common rather fortuitously coinciding with opening time at The Calf. We rounded off the slow but very enjoyable day with far too many beers. Although I wouldn’t advocate staggering back at midnight after a long day in the saddle, sometimes you’ve just got to do these things!!! ← Not quite the Pilgrims’ Way!